Urine formation begins when water and other small dissolved molecules and ions are filtered out of the glomerular capillary plasma and into the glomerular capsules by the process of glomerular filtration (glo-mer'u-lar fil-tra'shun). Large molecules, such as proteins, are restricted primarily due to their size. The filtration of these materials through the capillary walls is much like the filtration that occurs at the arteriole ends of other capillaries throughout the body. 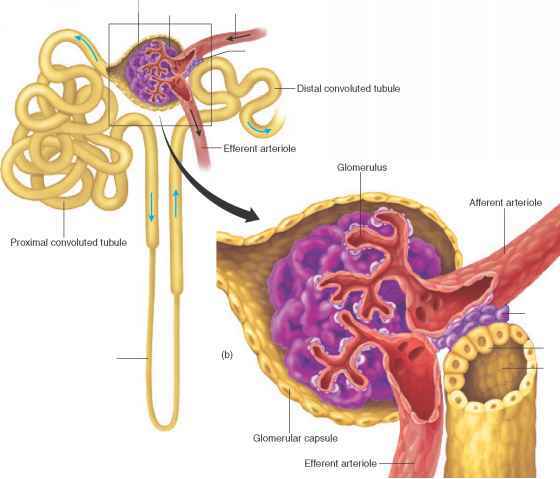 The glomerular capillaries, however, are many times more permeable to small molecules than the capillaries in other tissues, due to the many tiny openings (fenestrae) in their walls (fig. 20.15).